Auction Mercial (http://www.auctionmercial.com), the Web’s first video shopping catalog and online infomercial service, announced the creation of its one millionth AuctionMercial, a video Internet infomercial created using Auction Mercial’s fast, easy-to-use web service. Video Infomercials for eBay auctions give sellers the competitive edge, provide buyers with entertaining, TV-like shopping experience. Auction Mercial (http://www.auctionmercial.com), the Web’s first video shopping catalog and online infomercial service, announced the creation of its one millionth AuctionMercial, a video Internet infomercial created using Auction Mercial’s fast, easy-to-use web service. 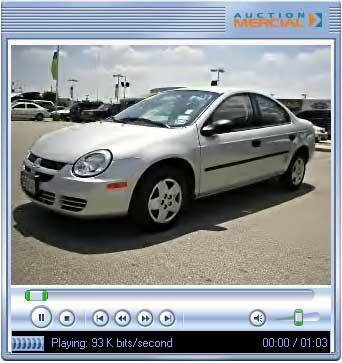 Auction Mercial, currently a free service to registered eBay sellers, allows sellers to quickly and easily add Internet infomercials to auction listings by transforming product pictures and text descriptions into an engaging, high-quality video experience, regardless of the viewer’s Internet connection speed -- even dial-up. As an added benefit, sellers’ completed videos are viewable on the company’s MercialShopper website (http://www.mercialshopper.com), the Web’s first video shopping catalog, a site designed to drive traffic and sales to sellers’ auctions or retail websites. Auction Mercial’s service removes the technical headaches and cost issues typically associated with adding video and audio to an auction listing. Sellers do not have the time to learn a complicated new tool or spend hours editing video. Auction Mercial automates the video creation process to remove the time and labor cost constraints. The result is a service that is easy to use, fast, automated, and currently free to registered eBay Sellers. Headquartered in San Diego, California, Auction Mercial provides easy-to-use, automated, high-quality video authoring tools for online marketplaces. Auction Mercial products allow online Sellers to create Internet Infomercials using pictures, text descriptions, and, optionally, recorded voice files without purchasing special hardware or software. Auction Mercial is certified by eBay as an eBay Compatible Application and is a member of eBay's Developer program and Affiliate program. For more information visit http://www.auctionmercial.com. Video Infomercials offer engaging, TV-like experienceAuction Mercials provide better communication, a better connection with the Buyer, and a more professional image for the Seller than a printed product description.